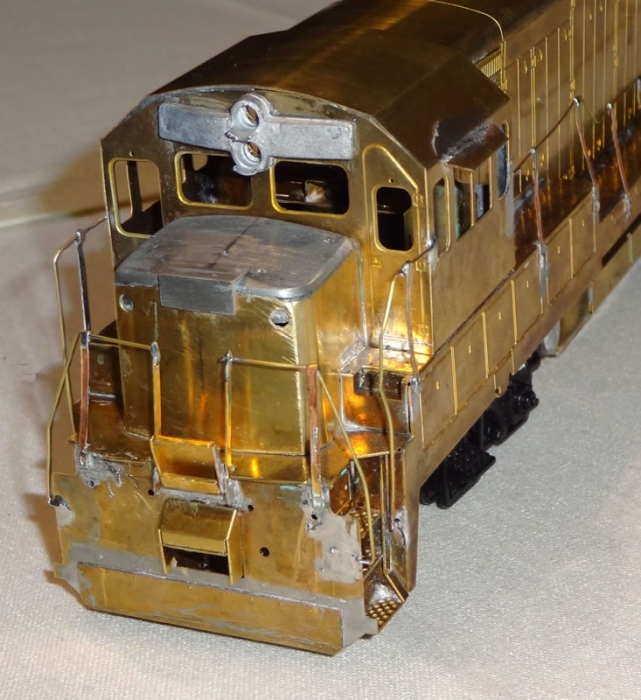 The S scalers at February 2015’s O Scale West Plus S meet in Santa Clara CA were pleasantly surprised to see the American debut of a new brass kit from the United Kingdom. 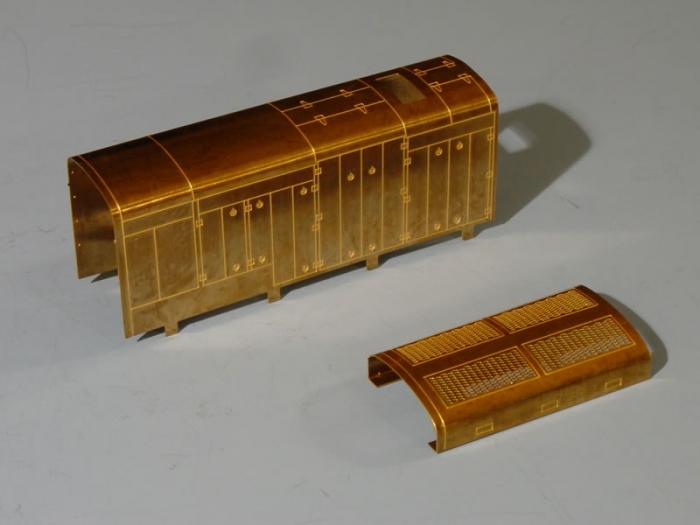 Mike Calvert was there, off in an O scale corner, displaying the new Gilmaur etched brass kit for an S scale U18B. Mike did the etching drawings; his friend Colin Stewart assembled the pilot model. 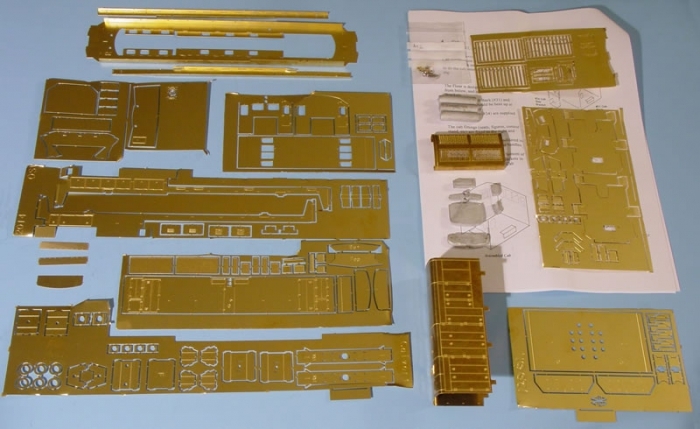 The kit consists of brass etchings, cast white-metal components, an envelope of machine screws and nuts, and a detailed instruction booklet. Detailing parts must be supplied by the modeler, e.g., handrail wire, grab irons, windshield wipers, door handles, coupler lift bars and brackets, and various items specific to the particular prototype road being modeled. Most of these can be obtained from BTS. 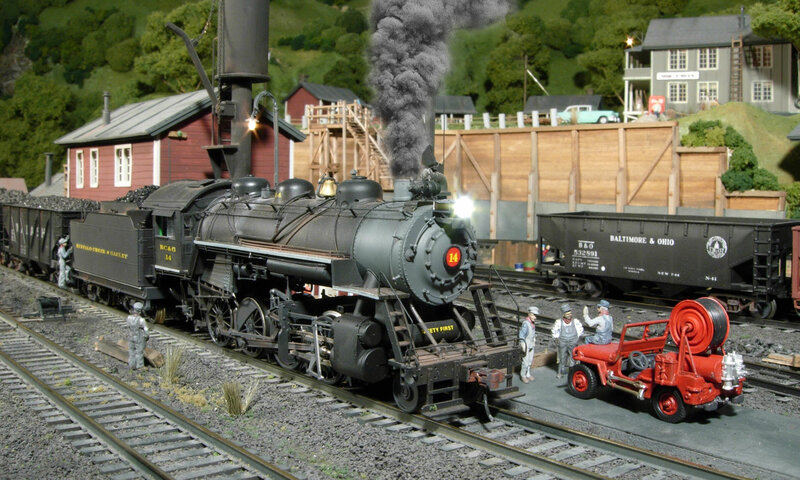 The modeler also needs to provide a motor, power train, and power trucks and sideframes. Prototype U18B locomotives sported a variety of truck sideframes, but AAR Type B (as on American Models RS-3 trucks) and EMD Blombergs were most common. The hood, radiator grid, and underframe stiffeners are pre-formed. All other brass parts are flat, reverse-etched with bend grooves for easy, crisp bending to the required angle. Where appropriate, the etchings are designed for slot-and-tab placement of the components (e.g., step treads) for soldering. Handrail stanchions are also included, etched to represent the prototype’s U-shaped cross-section. These are particularly fragile; Mike recommends tinning the rears of the stanchions with solder before removing them from the fret in order to provide added stiffness. Two kinds of motor mounts are provided: One U-shaped set for mounting American Models-type trucks that require a mounting nut high up inside the hood, and another set for under-the-floor power trucks such as Black Beetle and the forthcoming Jim King/NWSL Stanton drive. 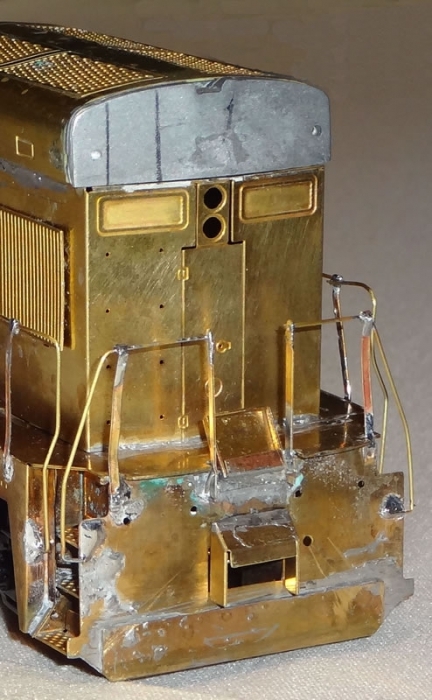 You need soldering skills to assemble the model. A soldering iron is the minimum requirement. 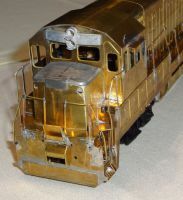 However, if I were to build this model, I would prefer to use a 140-watt trigger-operated soldering gun for the lighter work such as installation of steps, stanchions, and smaller details. Retail price: $200 USD (check or PayPal), including shipping. Contact Mike Calvert (mike.calvert@btinternet.com) to order.